Poster shown at ACM SIGGRAPH 2015 ( 9. August 2015-13. August 2015) In Proceedings of ACM SIGGRAPH 2015 Posters . Given a target shape and a target frequency, we automatically synthesize a shape that exhibits this frequency as part of its natural spectrum, while resembling the target shape as closely as possible. We employ finite element modal analysis with thin-shell elements to accurately predict the acoustic behavior of 3d solids. Our optimization pipeline uses an input surface and automatically calculates an inner offset surface to describe a volumetric solid. 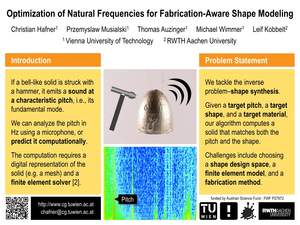 The solid exhibits a sound with the desired pitch if fabricated from the targeted material. 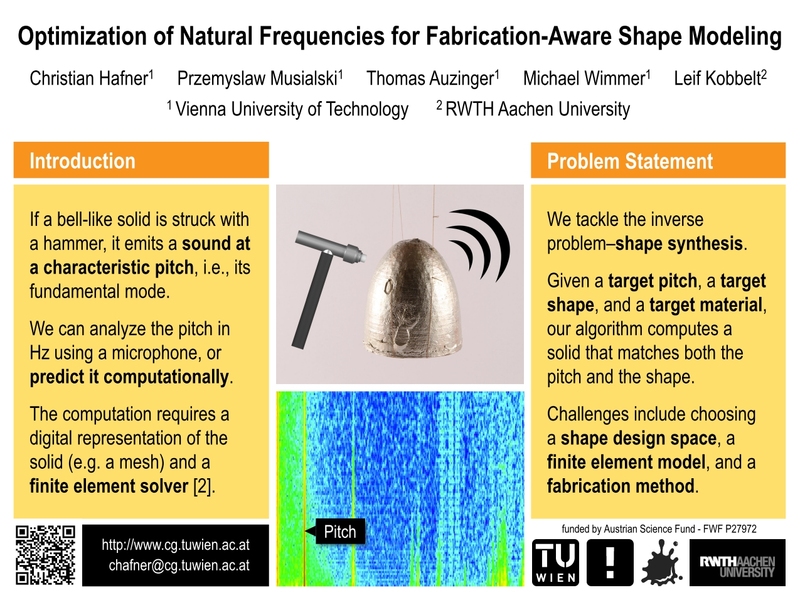 In order to validate our framework, we optimize the shape of a tin bell to exhibit a sound at 1760 Hz. We fabricate the bell by casting it from a mold and measure the frequency peaks in its natural ringing sound. The measured pitch agrees with our simulation to an accuracy of 2.5%. In contrast to previous method, we only use reference material parameters and require no manual tuning.